On-site, Public Scheduled & Tailored Courses. We understand that every client is different and as such customise training solutions to suit your individual requirements. We are interested in building strong, long lasting business relationships based on high quality training and customer care. We pride ourselves on responding quickly to queries and providing advice on all your training requirements. Training by video provides unrivalled delivery of essential information in concise and easy to follow videos. The videos can be made ‘bespoke’ to your organisation or you can choose from a selection of our own library of ‘soft skills’ videos. Over the past two years, Elite Training has delivered three blocks of training to support our recruitment drives. The training quickly brought our new staff members up to our required standard and prepared them for a variety of challenging roles. I have worked in partnership with Elite for a number of years now for both Soft Skills training & Technical IT training and have found them to be an outstanding training provider in every regard. The account management & customer service we receive in addition to the first class training is second to none. I would recommend Elite without hesitation. What I value most about Elite is the way they consistently work in partnership with their clients. They respond positively & promptly to all new requests, and always have a great solution to meet the client’s needs. I have no hesitation in recommending them to other organisations. Elite Training offers a comprehensive range of IT, Professional Best Practice and Business Skills training across the UK. Our experienced Account Managers work closely with our clients to deliver a range of solutions based on budgets, timelines and individual requirements. Whether you require one-to-one or groups sessions, public or closed company training, we will ensure you receive an individually tailored training service. When thinking about taking a PRINCE2 course this is quite often a question that gets asked. People are not sure if they need to attend the Foundation course or both the Foundation and Practitioner. So what is best for you? The PRINCE2 Foundation course is a 3 day course with the Foundation exam at the end of day 3. By taking the Foundation course and passing the exam you will show you have a good understanding of the PRINCE2 method. On the course you will cover in detail the 7 Principles, Processes and Themes of PRINCE2. This will give you a good understanding of the method so you could work effectively in a PRINCE2 environment. The course ends on day 3 with the PRINCE2 Foundation exam. If you pass this you will achieve the Foundation certification showing you have a good understanding of PRINCE2. The PRINCE2 Foundation exam tests your knowledge and comprehension of PRINCE2. The Foundation exam is a 60 question multiple choice paper. To pass the paper you need to score 55%. The exam is closed book. Ideally this course is for people who will be part of a project management team but not managing the project. People who are going to perform a Team Manager or Project Support would benefit from the Foundation course as this would give them a good underdtanding of their role in the project. The PRINCE2 Practitioner course is a 2 day course that is often taking together with the Foundation course making a 5 day course in total. By taking the Practioner course and by passing the Practitioner exam you will show that not only do you have a good knowledge of PRINCE2 but also that you can apply the method in a project environment. The Practitioner exam is taken on the morning of the second day. The Practitioner exam is a 2.5 hour multiple choice paper. In the exam there are 68 questions. Each question is worth 1 mark. The pass mark is 55%. The exam is open book as you are allowed your PRINCE2 manual. The exam is based on a project scenario and you have to show you can analysis and apply PRINCE2 in that scenario. Ideally the Practitioner course is for people who are currently performing a Project Managers role or who would like to move into a Project Managers role. The Practitioner certification not only shows you have a knowledge of PRINCE2 but also that you can apply the method. So hopefully if you have been asking the question – which PRINCE2 course is right for me – the information above might help you make up your mind. 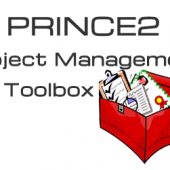 ‘Think of PRINCE2 as a tool box’. This is something I tell the delegates on the PRINCE2 courses I teach regularly. As I’ve mentioned in a previous blog PRINCE2 is not a rule book to be followed word for word. It’s a framework that provides you with the tools to manage your project effectively. It is a tool box! The key though to making PRINCE2 work for you is how you use the tools it provides. Think about it. If you have a tool box at home and you are doing some work on your house. You need to use the right tools at the right time in the right manner. If you don’t you could be in trouble or end up doing a poor job. It’s the same with PRINCE2. You need to use the right tools at the right time and in the right manner if you want the framework to help you manage your project well. So what tools does PRINCE2 provide? The answer to that is many. Let’s have a look at a couple. First of all the 7 Themes it provides guidance on. The PRINCE2 Themes are just key project management topics that as a Project Manager you would need to address not just once but continually throughout the project lifecycle. The Theme then gives you guidance on how to address that topic. It gives you the tools to manage that part of the project effectively. So for example in a project you will need to plan. So PRINCE2 provides you with the Plans Theme that will allow you to plan better. In the Theme it provides tools such as the Product Based Planning technique that allows you to scope your project better and to describe the products of the project to the suppliers so they know what to deliver. Secondly it provides you with 26 management products. These management products are just key sets of information that you can use to manage more effectively. For the management products to help you in the project you need to use them in the right manner. So what format will they be in? e.g. a document, a spreadsheet, a power point presentation, an email or even a conversation (although I would stay away from that personally). You need to use the right management product, at the right time and in the right manner. So get the PRINCE2 tool box out and let it lead you to your project success.